2" field flattener for TS-Optics apo refractors offers optimal field correction and illumination with diagonal up to 45mm. When the camera's sensor diagonal is larger than 25mm, we recommend this flattener. On camera side this corrector has M48x0.75 thread with an optimized working distance between 108 and 128 millimiters (based on telescope focal lenght) so there's a lot of space to install many astrophotography accessories. Which adapters do I need to connect my camera? With long back focus, this field flattener offers enough space to integrate additional accessories like off-axis-guiders, filter wheels or filter drawers. 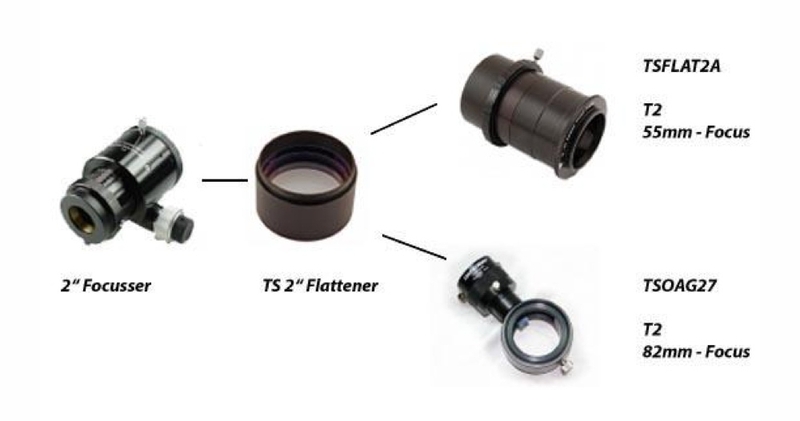 If you want to use a DSLR camera, in order to connect to the corrector and have the DSLR sensor at the right distance of the corrector lens, you need to add the TSFlat2A accessory. A CCD camera has a lower backfocus than a DSLR camera so you will need to add, after the TSFlat2A accessory, a T2 extension. To recommend the right articles, please write us with the back focus distance of your camera (distance from connection thread to sensor surface) and eventually existing/wanted filter wheels, off-axis-guiders etc.